Store bought tostadas kind of saved me this week. 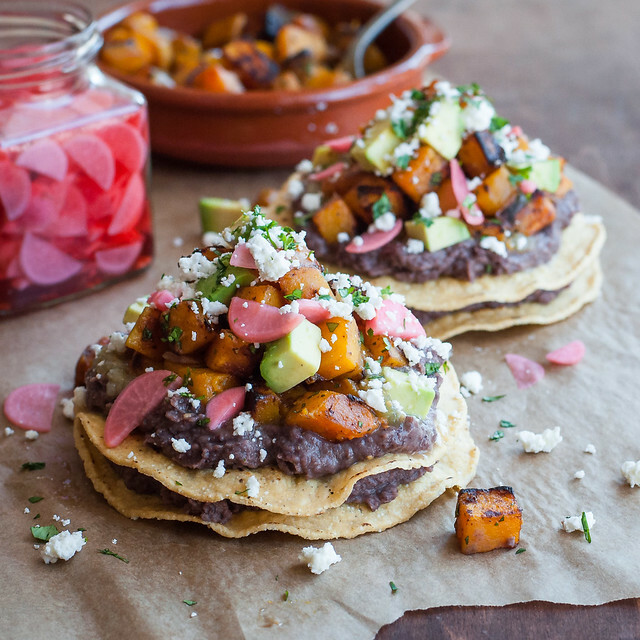 Months ago, I saw the episode of Triple D featuring Taco Bus and their wildly popular butternut squash tostadas. Unfortunately, I don’t live close to any Mexican restaurants with creative vegetarian options, and I attempted a version at home that, I’m sure, paled in comparison to the original creation. I tried to shallow fry my corn tortillas but, as usual, was nervous about getting the oil temp too high and splattering my kitchen with hot, greasy oil. So, I didn’t get the temp high enough, and I ended up with semi-crispy, semi-chewy tostada shells. On top of it (pardon the pun), my quick sauté of butternut squash and peppers lacked the character that Taco Bus appeared to achieve in their butternut squash tostada recipe. I let it go, unenthusiastically noting the recipe for a future blog post. Fast forward a few months, as I’m planning for some semblance of order in my posting schedule amidst upcoming travel and my wedding. 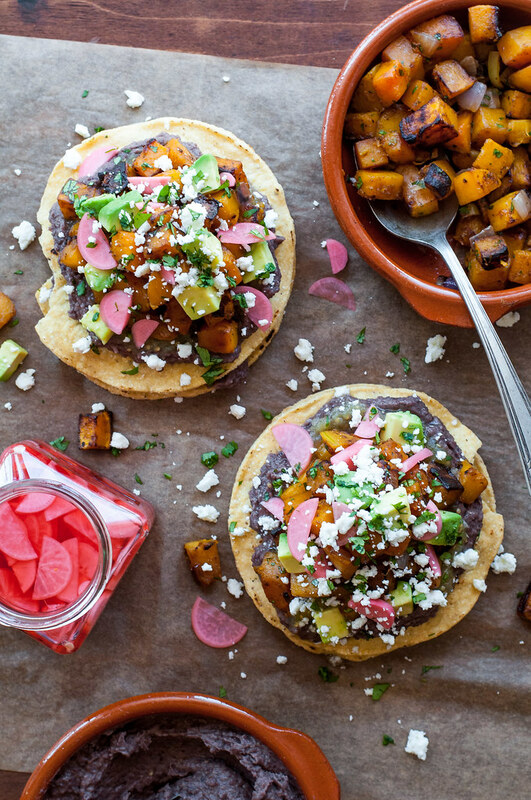 The butternut squash tostada idea hadn’t moved, and since squash is returning in its full fall glory, I added it to the schedule, not sure how I might spin the recipe for better flavor and quick weeknight prep. After all, if you can’t make butternut squash tostadas for dinner on any old school night, what good are they? My crazy mind, research, and circumstances all conspired into a double decker vegetarian tostada recipe that I want to eat every night this week, and that my omnivorous fiancé scarfed just as excitedly as me. First off, I decided that adding some vegetarian protein was absolutely essential. A tostada shell topped with a scoop of diced butternut is a great handheld snack to order from a food truck, but it’s not the kind of thing that will keep me full during an evening of blog and household work. Buuutttt, in a recipe with lots of components, I also don’t have tons of time to spend on fancy homemade refried beans. I switched things up, and instead of refried, I whipped up a quick (like 2 minutes quick) black bean dip/spread to smear over the tostadas. I highly recommend doubling or tripling that part of the recipe, and saving some as a healthy chip dip for your weekend football party or a late night snack. Minor note: you might notice the dip looks brown in the food processor, and slightly purple in the rest of the photos. It’s the exact same dip! Different backdrops and lighting conditions just give it a different hue. Sorry for any confusion. The beans are amazing no matter if you eat them in daylight, yellow indoor light, or no light at all. Next came the tostadas. I learned a lot from America’s Test Kitchen, including the knowledge of store bought tostada “shells”! I’m a sucker for doing things the hard way most of the time, but if ATK is promoting store bought tostadas, then, by golly, they’re good enough for me! As their test indicates, the Charras brand tostadas I found worked well. They have a bit of added sea salt, so they’re delicious for sneaking a few bites while you prep dinner…not that I would know. Mission brand was the highest rated purchased tostada, so use that if you can find it (the taste test is a few years old, and I had trouble finding the product online or on shelves). If you like the ease of buying tostadas, but not the fried aspect (or if you can’t find ready made tostadas at the store), just a couple extra steps will get you homemade baked tostadas with less mess and less oil than frying. See the recipe below for instructions to bake your own shells. Why was I so motivated to keep this recipe quick? Steve is still down with a newly broken collar bone (clavicle, if you want to get technical). Attending to his rotation of ice and medication, not to mention keeping him clean and fed (and caffeinated), is not so much busy as it is intermittent. I would gladly take keeping him home for work under my care infinitely, but it’s hard to find a block of time to work on recipe development, make dinner, or fold laundry. Let’s just say I have a new respect for moms this week! And I can’t imagine how much more intense it is when you have little ones with zero verbal skills…except probably screaming and/or crying. At least my patient can speak and does not at all insist on choosing his own outfits. 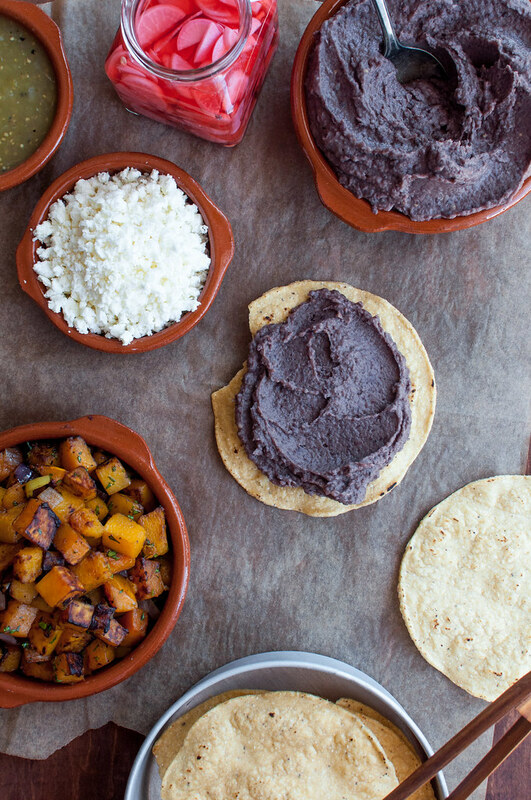 The technique is easy if you follow the recipe, but let’s take a minute to talk about the centerpiece of these tostadas: the butternut squash! Why, you may ask, have I chosen to pan fry, aka babysit, them when I could have just tossed them onto a tray and into the oven? Honestly, I’m addicted to the results of the pan fry. With butternut squash, it seems to take just the right temperature and time, and lots of butter, to get browned perfect exteriors via the oven. The pan fry uses a predictable amount of oil, isn’t fussy about temperature, and calls for the same consistent cook time to achieve deeply browned squash cubes that are almost crisp on the outside and totally tender inside. I use the same pan to first brown a handful of onions and hot peppers for extra indulgent flavor and a bit of heat. 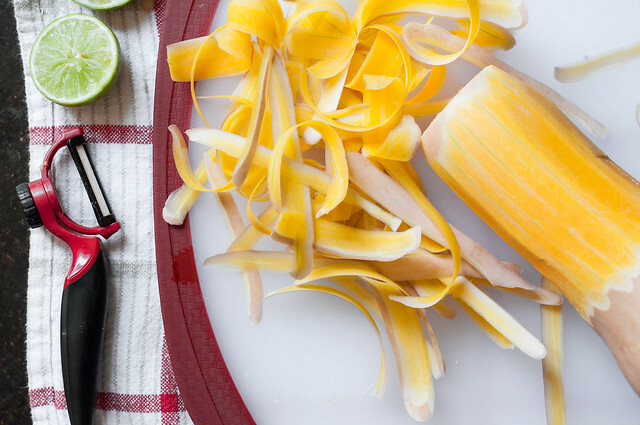 If you change up the recipe and go for roasting, just be sure to cut your squash into small, bite-sized cubes so you don’t end up needing a knife to attack the tostada. I don’t always go for the step-by-step pictures, mainly because it takes way too long before I actually get to put the food in my mouth after photographing it, but I thought it would be fun and useful this time. The graphic below is Pinterest ready, and you can find the full size images over on my flickr account. 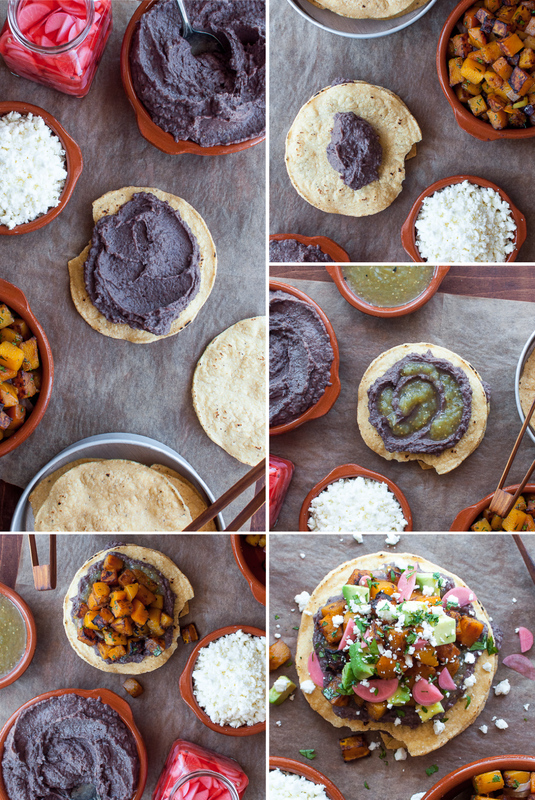 Let me know what y’all think of the tostada, and what fall ingredients you want to see in recipes on NCK! I love requests as I plan for future recipes. 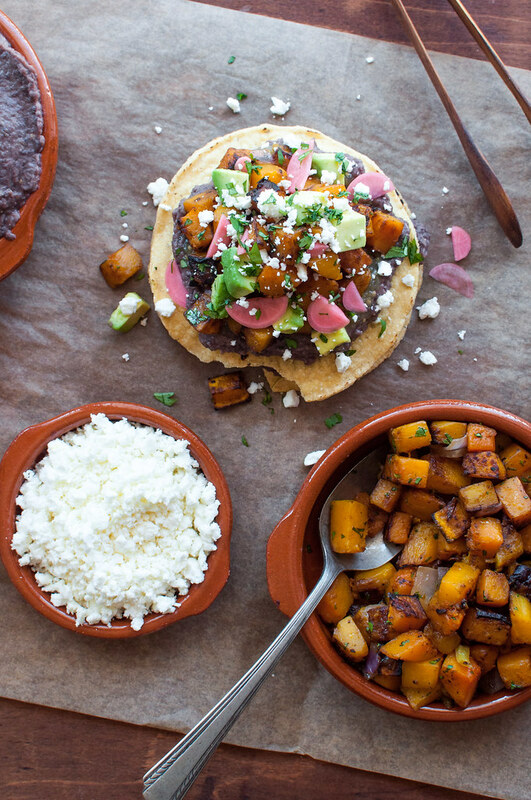 These are not your average tostadas. 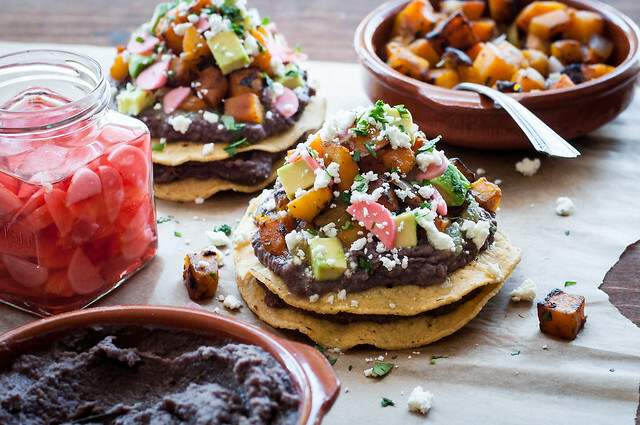 They're stacked double decker style, with plenty of room for slightly spicy, extra filling black bean purée, then topped with a mound of tender, pan fried butternut squash cubes. 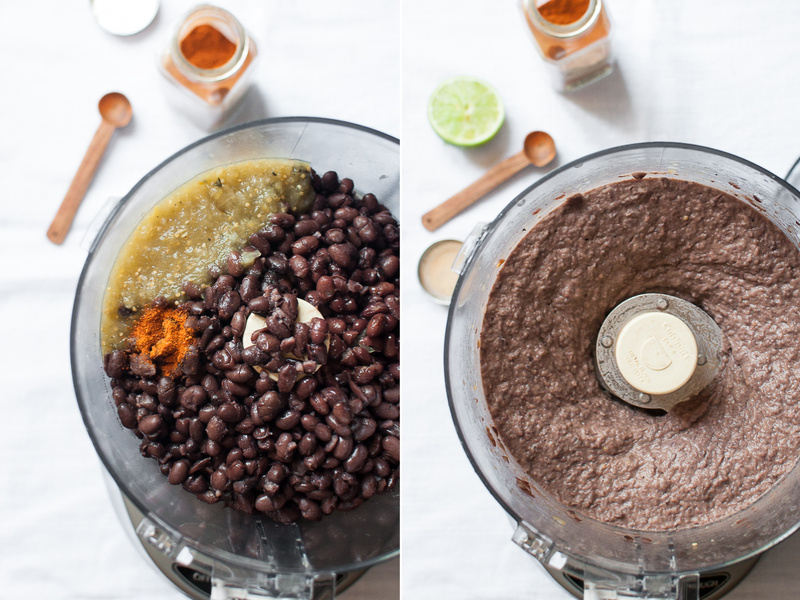 Process the black bean purée ingredients together in a food processor until smooth. Because it uses presumably well seasoned salsa, extra seasoning isn't required, but adjust if desired. Set aside at room temperature (or refrigerate if making ahead). Heat ½ tablespoon oil in a 10 to 12 inch nonstick or cast iron skillet over medium high. Add hot pepper and onion; cook until onion is browned, then remove to a large bowl. Heat 1 tablespoon oil in the same pan, reducing heat slightly. Add half the squash and cook undisturbed for 5 minutes, until browned on one side. Sprinkle with salt and pepper and cook another 5 to 7 minutes, stirring a few times, until further browned and tender. Remove to bowl with peppers and onion and repeat process with remaining squash (if using a 12 inch pan, you can cook all the squash at once using 2 tablespoons of oil). 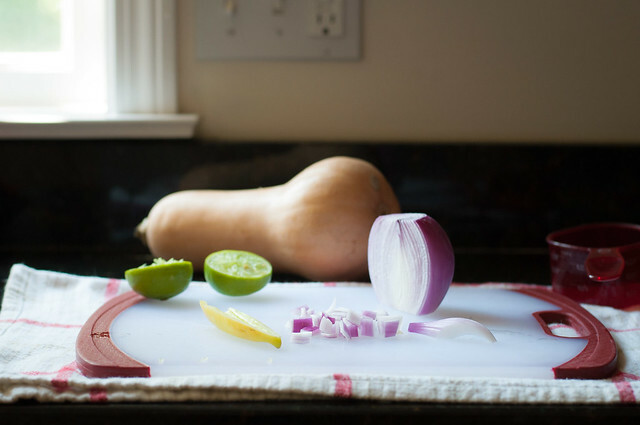 Toss together squash, peppers and onion, 1 tablespoon cilantro, and salt and pepper to taste. To build 1 tostada: Spoon ¼ cup bean purée onto a tostada shell, then press another shell over it. Spoon another ¼ cup beans onto top shell and spread almost to edges. Top with about 2 tablespoons salsa and a large scoop of the squash mixture. Top with a fourth of the avocado and radishes, then sprinkle with a tablespoon of crumbled cheese and a pinch of cilantro. Serve warm or at room temperature. On the advice of America's Test Kitchen, I used Charras brand pre-made tostada shells. I also baked my own shells, which is easy if you're looking for a slightly healthier (i.e., not fried) variation and don't mind an extra step. Preheat oven to 450 (F) and brush both sides of 8 corn tortillas lightly with vegetable oil. Place on a rimmed baking sheet (or sheets) in a single layer and cover with an upside down wire rack, so the shells don't curl. Bake in the upper or lower third of the oven for 8 to 10 minutes, or until beginning to darken and crisp. Turn once during baking and watch very carefully to avoid burnt tostadas. To make pickled radishes, I used the pickled red onion recipe from my eBook, replacing red onions with thinly sliced radishes. Or, try Kate's recipe for nearly instant results. OR, go buy some ready made at the store. As written, recipe is gluten free and vegetarian, if your cheese does not contain animal rennet. If you skip the cheese and check your ingredients, the recipe is vegan.